Mick Martin pulls his Lancaster away from the Möhne Dam as his 'Upkeep' bouncing bomb exploding behind him sending a huge plume of water into the air. 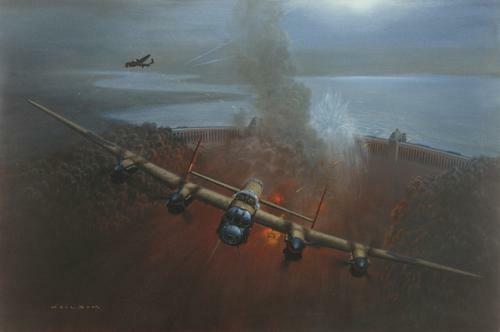 On his starboard side Guy Gibson flies close to draw enemy fire from the guns on the dam towers. 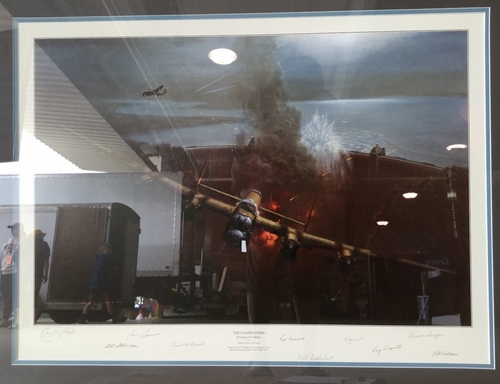 Released to commemorate the 60th Anniversary of one of the most audacious air raids in history this outstanding piece carries the original signatures of nine of the legendary Aircrew who took part in the Dambuster Raid, 16/17 May 1943.